Class Reunion leaders face basic decisions about selecting a place, a date and time, providing food, informing classmates in timely ways, building attendance, planning an interesting program, and making sure parking is available. Cost is also an important consideration. 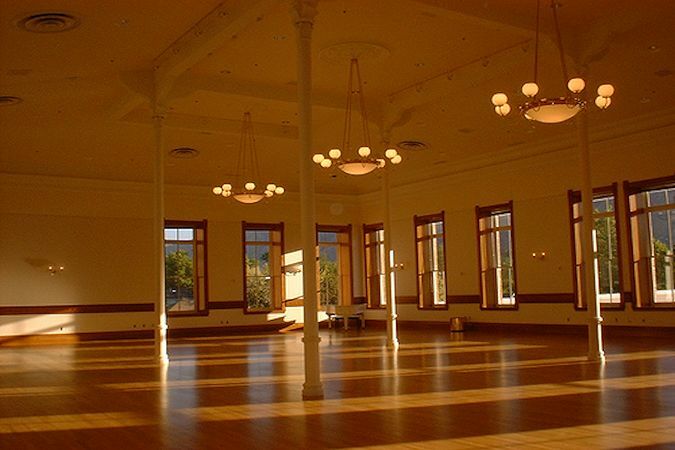 There are many possible reunion venues, but because their calendars often fill up quickly, it is suggested that reservations be finalized between one year and usually no later than four months before the reunion. 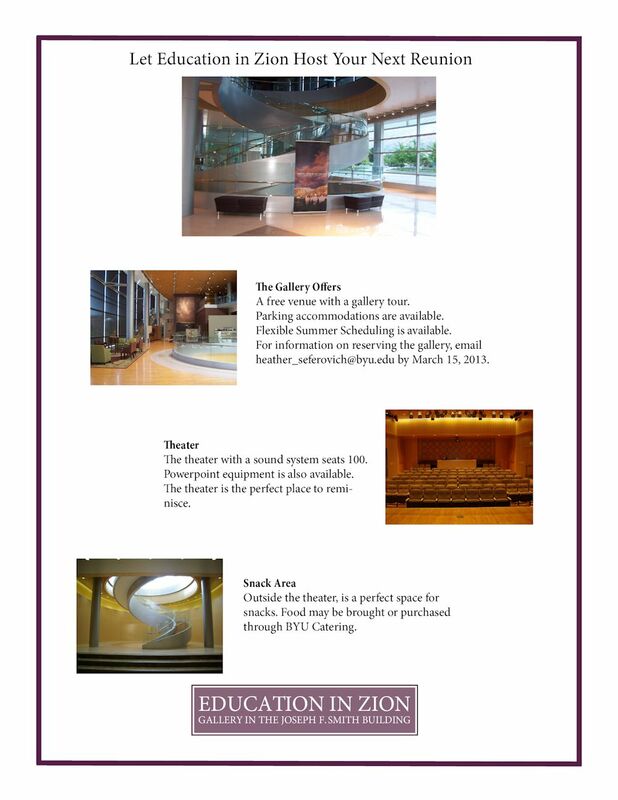 A new venue is available this year for the first time, the Education in Zion Gallery in the Joseph F. Smith Building on the BYU campus. More about this below. Gordon B. Hinckley Alumni Building at BYU. Thanksgiving Point in Lehi ~ Room + food ~ in-house catering only. Times for reunions have varied widely, however, as alumni increase in age, daytime hours are preferred more and more. Reunions just before or just after July 4th have been very popular. Other popular times: mid-June and early September (but be careful to avoid conflicts with BYU football games). Some venues require the use of a specific caterer, while others are more open to various caterers, or food provided by classmates. Each week, five to ten BYH alumni send in street address and/or email changes to the BYH Alumni Directory on this website, so this is a good place to start. Email messages can be written, copied, and pasted into individual emails to be sent to addresses on this site one by one. Known email addresses can be accessed by clicking on the "envelope icon" on each persons record. These records can be accessed individually or by class year. Telephone numbers for each classmate can usually be found on this BYH website, and this is an effective way to find out if classmates intend to attend. If you have trouble finding current contact information about a classmate, remember that many of us had siblings in other classes, or had close friends -- call these people to seek up-to-date addresses, emails and phone numbers. --Finding and contacting lost alumni, etc. If a BYH alumnus also attended BYU, then another good place to look is on the BYU Alumni Directory, which is available only to BYU alumni. Classmates mostly just want to talk with each other. It is recommended that program leaders provide each alumnus a turn at the microphone. Avoid musical performances, etc. Soft background music is best. Each venue will have its own advantages and problems, so discuss parking with event contacts. Some will have no parking during certain hours, and almost unlimited parking during other hours, even on the same day. If the cost per person is high [more than $25 per person], it may deter some from attending. 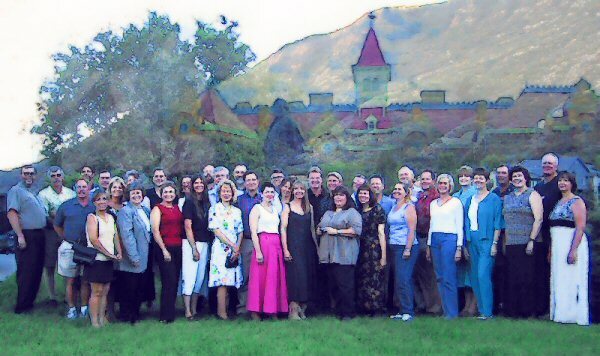 Classmates who can afford to underwrite the reunion financially can do a great service, helping keep costs for low for others who could not otherwise afford to come.